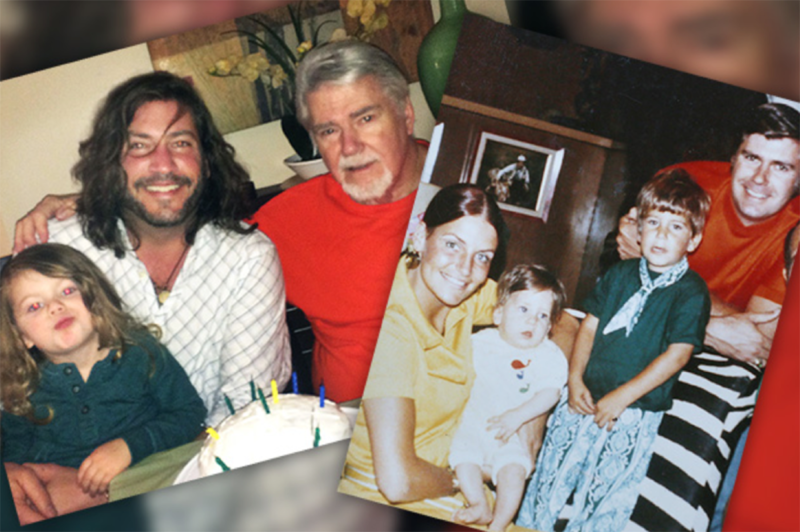 Stephen Katz’s estranged father was exposed to Agent Orange in Vietnam. Now the photographer wonders if that caused his own health problems. The package from my father arrived in 2009, a few months after my latest heart surgery. The yellow envelope contained a two-inch stack of documents: handwritten notes, old photographs, newspaper clippings, medical files, and military service records. Together, they told the story of a man I barely knew. I hadn’t heard from my father, Al Weigel, in more than 20 years. At first, I didn’t read any of it. Why would I want to rip open that wound? I tossed the envelope onto a shelf in a closet, and there it sat for years, forgotten behind a pile of clothes. I didn’t know it held information that would link my life — and health — to a war waged before my birth. It wasn’t until 2012, not long after I’d become a father, that I remembered the envelope. I pulled it back out, figuring someday I would want to tell my son where he came from. I studied pictures of Al, noting our shared features: I have his smile and broad shoulders. I learned that his family was part Irish and part German. That my grandfather had been a college track star — and later an alcoholic. That my dad had grown up in a middle-class New Jersey town before attending the United States Naval Academy and going off to fight in Vietnam. The package also delivered a warning: A handwritten note attached to a stack of Veterans Affairs medical records. During the war, before I was born, Al had sprayed Agent Orange along riverbanks in Vietnam, often soaking his uniform in the herbicide. The exposure, he wrote, had caused him serious health problems, including a neurological disorder, and he believed it also might have harmed me. My mind raced as I thought of my own troubled medical history. A heart defect diagnosed at birth. An underactive thyroid. Problems with my nervous and immune systems. More recently, Type 2 diabetes, hypertension, and a nerve disorder that severely limits the use of my right hand. I’m now 46. A lean 6-foot–2 and 190 pounds. 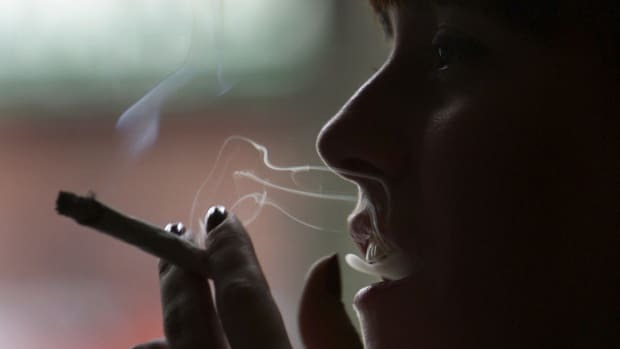 I don’t smoke. I try to eat healthy. But the number of pills I swallow every day would make you think I’m twice that age. As a teenager, I was sick so often, I joked that my healthy brother and I couldn’t be related. He’d been born before the war, before Agent Orange. What my father didn’t know was that I’d already become familiar with Agent Orange and its consequences. I’d made several trips to Vietnam by then, photographing people with much worse health problems than my own. They were descendants of the Vietnamese who’d come in contact with the chemicals — those on the other end of my young father’s fire hose. I’m a photographer for the Virginian-Pilot, and I often spend my time off traveling overseas to document the work of humanitarian charities and working on other projects. When I finally opened Al’s package, I’d been working on a documentary film set in Vietnam about a second-generation victim of Agent Orange. Now I wonder: Could I be one too? I’m not the only one asking the question, it turns out. Thousands of adult children of Vietnam veterans are wrestling with the possibility. My father was one of at least 2.6 million U.S. veterans who may have been exposed to Agent Orange. 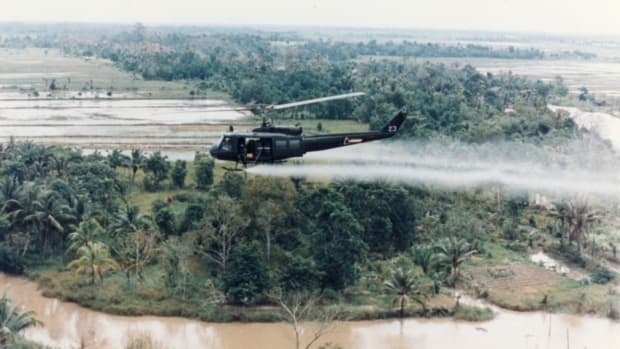 The military sprayed it by the millions of gallons across Vietnam, aiming to kill thick brush and trees and make it harder for the Viet Cong to spring out of the jungle. In the years since, the Department of Veterans Affairs (VA) has acknowledged the chemical harmed those who came in contact with it and compensates them for a growing list of illnesses. A small number of veterans’ children — those born with spina bifida — are also eligible for Agent Orange payments. So are the children of female veterans born with about a dozen other defects, though the vast majority of Vietnam veterans are men. Researchers have long been cool to the idea that a man’s exposure to chemicals could hurt children fathered later. Recent studies, though, suggest it’s at least plausible. Male rats exposed to dioxin — the most hazardous component of Agent Orange — have passed genetic mutations on to their babies in laboratory tests. But researchers say more work is needed to prove what many Vietnam vets have long feared — that their children have inherited the burden of a war they had no part in. 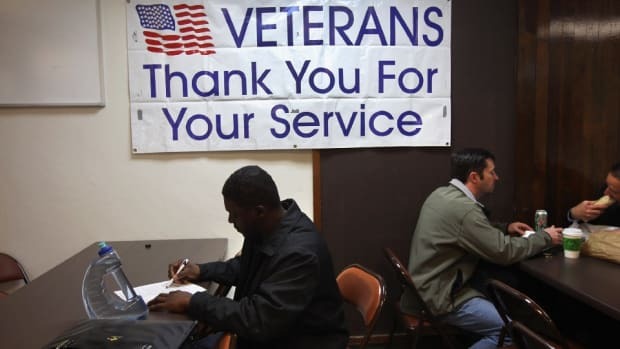 Members of Vietnam Veterans of America have hosted town hall meetings across the country in recent years, urging vets to pass on medical and service records to their children, even if they’re no longer in touch with them. 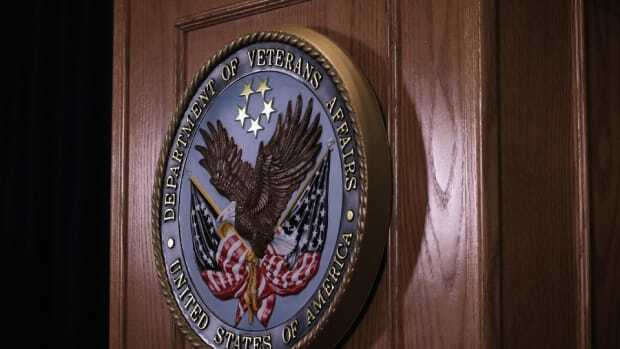 That way, veterans advocates say, children of vets will be prepared to fight for disability benefits if the science someday proves Agent Orange can impact a man’s children. 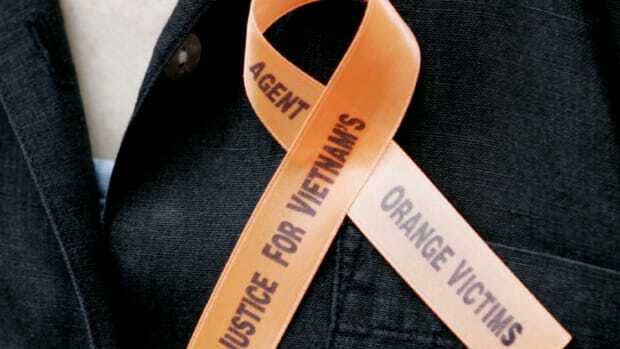 VVA is backing a bill in Congress, the Toxic Exposure Research Act, that would require the VA to study the effects of wartime exposures on children and grandchildren of vets — from Agent Orange in Vietnam to burn pits in Iraq. My father sat in on one of those Agent Orange meetings in New Jersey. Soon afterward, he put together the package of information and sent it to my brother, who passed it on to me. For years, I had no interest in re-connecting with the man. Agent Orange brought us back together. My childhood recollections of my father are like hazy dreams. I remember going with him to the Macy’s Thanksgiving Day parade. He lifted me on his shoulders to see above the crowd. Another time I recall watching a boxing match with him. Muhammad Ali and Leon Spinks, I think. I was too young then to understand the problems brewing between my parents. They separated when I was seven. Dad had returned from the war a different person, and over time they’d drifted apart. He would come home late some nights and say he’d been out on his boat; Mom would call him a liar. I remember closing the door to my room and slipping under my covers to drown out the yelling. I didn’t see him much after the divorce. My brother and I were told he was a deadbeat, that he didn’t want to be part of our lives. I accepted that as fact. Growing up in New York in the years after, I used to search for him in crowds, wondering if we’d bump into each other. Hoping. I was sick often back then. I took antibiotics like they were vitamins. After I turned 13, the murmur I was born with worsened. Caused by a defect known as aortic stenosis, blood had begun back-flowing into my heart, straining it. After months of feeling nauseated and lightheaded, my pediatric cardiologist told me I needed open-heart surgery. I didn’t know it at the time, but as they wheeled me into the operating room, my father showed up. He’d learned of my surgery and wanted to make sure I was OK. He wasn’t there when I woke up though. My family, I’d learn years later, had told him to leave. I was feeling unusually ill during my first trip to Vietnam in early 2009. I’d traveled with a group of dentists who’d set up a free clinic in a remote village. The charity that sent them paid for my travel, and, in exchange, I photographed their work for use in promotional materials. I pressed on despite feeling lightheaded, short of breath and nauseated for much of the two weeks there, not wanting to squander a chance to explore a new country. On a previous trip to the Philippines, photographs I took of children with untreated hydrocephalus led a pharmaceutical company to donate thousands of dollars’ worth of medical supplies and send a surgeon to treat the kids. In Vietnam, I hired a local guide and asked him to find an orphanage like the one in the Philippines, figuring I might be able to re-create that effort. Something got lost in translation. He drove me to a rural orphanage, but as we stepped inside the darkened building, I didn’t see anyone suffering from hydrocephalus. The sound of moaning and the stench of feces filled the air. Dozens of children sat atop metal beds without mattresses. Some were hitting themselves. Some were chained to the beds — to protect themselves and others, I was told. Many had severe physical deformities. “What is this place?” I asked a worker. The orphanage was for those believed to have been harmed by a parent’s exposure to Agent Orange. I didn’t know anything about the chemical before then, but I’d soon learn Vietnam is full of places like this. 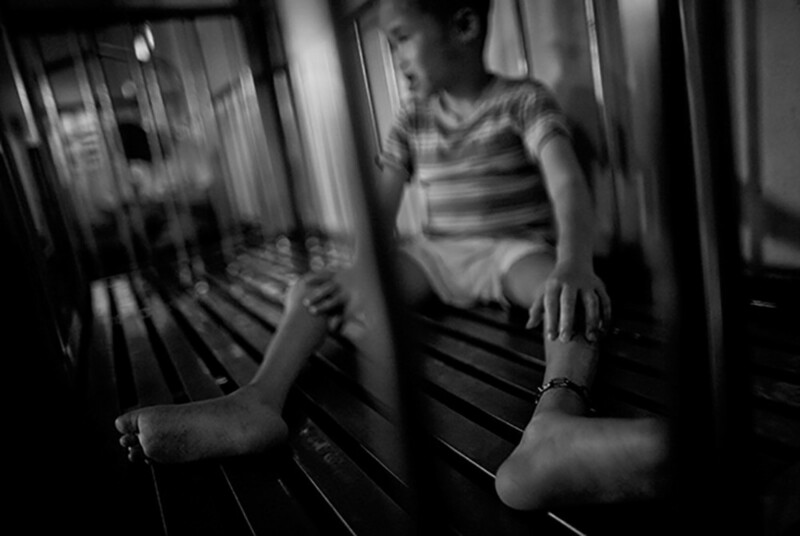 Vietnamese parents who can’t afford to care for a child with disabilities often face an unthinkable choice: Abandon the child at one of these orphanages, or let their other children go hungry. I watched as a father made that decision. The sadness in his eyes as he walked away from his screaming son haunts me, especially now that I’m a dad. I asked my guide if he knew anyone who suffered because of a parent’s Agent Orange exposure who was capable of speaking. He drove me a few miles to the town of Cu Chi to meet Thanh Thao Huynh. The woman, known as Thao, was born with crippling deformities — a shrunken body, stunted legs, brittle bones — that prevented her from attending school. But she’d taught herself to read and had created a small library in the shed where her father, a pig farmer, stored feed and fertilizer. Many neighborhood children visited her library to read or borrow books. I asked Thao, “If you could have anything, what would you ask for?” Her answer surprised me: just a few hundred dollars to buy more books to share with children. Months later, after I’d returned home, that short story and a photograph I made of Thao would inspire a friend of mine and lead to the start of the documentary project, which would span several years. But first, I needed to take care of myself. I was feeling even more nauseated and short of breath as we left Vietnam. Back home, my cardiologist conducted tests and came back with an urgent diagnosis. Blood was again back-flowing into my heart. I needed surgery, and right away. A few years later, after my son was born and I’d begun grappling with what it means to be a father, I finally opened the package from Al. I read through the documents over several sittings. I noticed, mixed in with his records, a letter of recommendation from his commanding officer in Vietnam. It was dated April 4, 1969. Al was being considered for a job with the Central Intelligence Agency. My father, it turns out, had served as an assistant to the man who had commanded naval forces in Vietnam and who later became the youngest to serve as chief of naval operations. Zumwalt’s legacy is also tragically entwined with Agent Orange. He’d given the order directing river boat crews like my father’s to spray the herbicide along riverbanks. Among those who carried out that work: Zumwalt’s son, Lieutenant Elmo Russell Zumwalt III. A decade after handling the chemical, the younger Zumwalt was diagnosed with lymphoma, and later Hodgkin’s disease, another deadly form of cancer. He died in 1988 at age 44, leaving behind a wife and two children — including a son born after the war with a severe congenital dysfunction that confused his physical senses. The elder Zumwalt had been misled about Agent Orange, he said years later. He’d been told it posed no threat to humans, though the chemical companies that made it — Monsanto and Dow — already had plenty of evidence that wasn’t true. Despite all that, the admiral said he had no regrets: His decision likely harmed his son and grandson, he acknowledged in an interview with the New York Times in 1986, but it also probably saved the lives of countless U.S. service members, he said. In 1985, the same year that Zumwalt’s son got his second cancer diagnosis, tens of thousands of Vietnam War veterans put on their combat fatigues and marched across the Brooklyn Bridge and down Broadway in the biggest parade in New York’s history to that point. The ticker-tape march was advertised as a belated “welcome home,” 10 years after veterans returned to protests. I was 15 and living on Long Island. 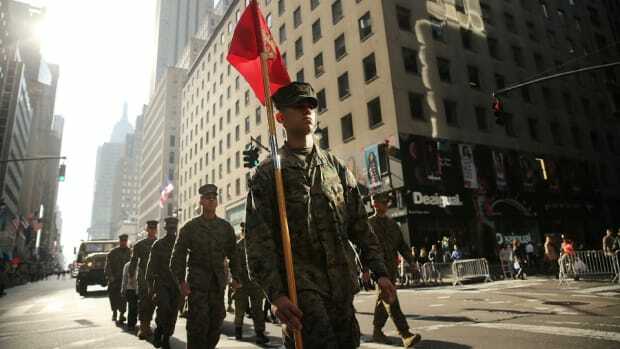 I pestered my mother to take me to the parade that May, secretly hoping to spot my father. I hadn’t seen him in more than five years but still thought of him often. If I saw him that day, I didn’t recognize him. A few months later, we met at a lawyer’s office. My brother and I were filling out paperwork to take our mother’s maiden name, Katz. Because I was a minor, I needed my father’s permission. I stared at the ground as I explained my decision. He said he understood. I told him that we’d gone to the veterans parade, trying to change the subject. He said he’d marched in it and was sorry he missed me. We shook hands, and he left. I wouldn’t see him again for nearly three decades. 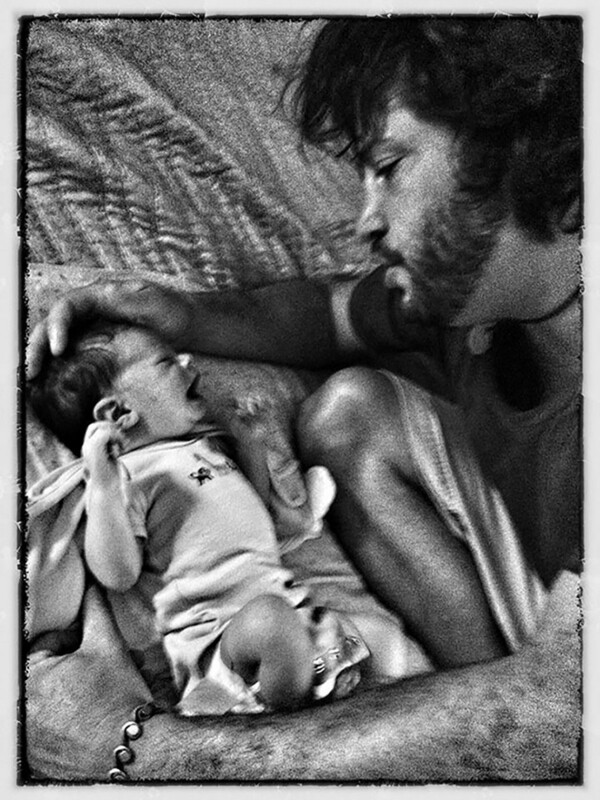 It’s incredible what fathers pass on to their children, even when they’re not around. Even when they don’t mean to. Last year, a groundbreaking study found that the children of men drafted to fight in Vietnam are worse off today than the children of men who stayed home. On average, according to the study, we earn less than our peers and are less likely to have steady jobs. There are many possible reasons for the disparity, but researchers suspect the psychological impacts of the war play a major role. When someone suffers from post-traumatic stress disorder — as was the case for many Vietnam combat veterans, including my father — it affects the whole family, research shows, and can cause behavioral problems in children. The economists who conducted the study didn’t look at the generational impacts of Agent Orange. That isn’t surprising though. When I’ve asked doctors if my father’s exposure to the chemical could be affecting my health, they typically look at me as if I’ve asked if they believe in aliens. Heather Bowser, the president of Children of Vietnam Veterans Health Alliance, knows the feeling. Her father was exposed to Agent Orange. A few years later, she was born premature, missing a leg, a big toe, and several fingers. She leads a group of more than 3,700 other children of Vietnam veterans who believe their health has been affected by Agent Orange. Most doctors have no clue about the herbicide, Bowser told me. But neither do most children of veterans, she said. Many in Bowser’s group suffer from problems with their spinal cords. Heart conditions like mine and problems with the thyroid and immune and nervous systems are also common. Not everyone has obvious physical conditions like her, she told me. Bowser, 43, recognizes that not every illness can be blamed on Agent Orange. And she acknowledges the science hasn’t proven a generational impact, though the anecdotal evidence she’s gathered seems significant. She agrees more research is needed. I asked her how I could help. She told me to tell my story. I finally picked up the phone and called my father a few years ago. He seemed shocked to hear from me. He told me he’d always wanted to be a part of my life, but that others in my family kept him away. He said that he’d sent birthday cards that apparently never reached me. He told me he’d re-married and had been a good dad to his step-daughters. He drove to Norfolk three years ago to meet my wife and his grandson, Sawyer. It was hard to reconcile the tall, strapping figure from my memories with the hunched and frail man who came to visit. He’d recently moved into a condominium in Hackensack, New Jersey, because he was tired of falling down the stairs at his home of 25 years, he said. He’d had six spine operations before he learned he had peripheral neuropathy, among other debilitating conditions tied to Agent Orange exposure. He’s 73, younger than some grandfathers, but was too feeble to hold his grandson. In 2015, my family and I visited him on my birthday. I felt like a small boy as he joined the chorus singing to me before I blew out candles. Last year, the documentary I helped make, Thao’s Library, was released and won the top award at a major film festival. It was later screened at AMC theaters across the country. I traveled to New York for the premiere in Times Square and invited my father. He’d told me he was proud of the work I do and couldn’t wait to see the film. He talked about it for weeks. I was excited for him to be there. But a couple hours beforehand, he called and said he was sorry. His health had worsened, he said. He didn’t think he could handle the hour-long drive into the city. He sounded heartbroken. I felt the same as I settled in to watch my film on the big screen that evening. Agent Orange brought my father back into my life. I fear it’s also left us too little time together. This story originally appeared on ProPublica as “A Father’s War, a Son’s Toxic Inheritance” and is re-published here under a Creative Commons license.